Lazy? Soak baby. The best way to clean a paint brush start simply by soaking it. We find a bath tub if there is no utility sink and we routinely put off cleaning for the night and let the brush soak in the bucket. The next day it is so easy to clean as over night the floating brush and roller lets the paint falls to the bottom of the bucket. There is no need for smelly solutions to help you clean the brush, not even soap. Just water. Don’t soak more than one night (although we have). The reason is that the wooden handle slowly swells and will push on the metal band: not a huge problem, but depending on the wood, it can ruin a brush. 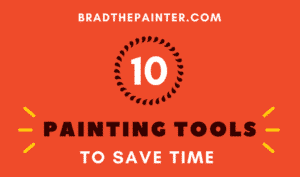 The best way to clean paint brush is sometimes to not clean them! Why clean paint brush every day? We don’t. And our (quality) brushes go for months of daily use. Easy Clean-up: how-to. Done the job or just for the day? If you are just done for the day and plan to take it up again in a day or two, wrap the brush with several drops of water in an air tight plastic bag. Cover the paint bucket or tray the same way: drape a damp cloth over the bucket or tray and then cover with plastic. Air tight is good, but if you are coming back the next day: don’t worry. Run under (warmish is best) water and squish it into the stream of water over and over until really done bleeding paint, then comb the bristles straight, and let dry completely. Keep that cover for storage. If the bristles get bunched up in storage, just wet again, comb and dry. It’s good to use regular hair conditioner on the bristles once every few uses, but not essential. We take very good care of our Purdys. To clean a brush, you don’t need solvents that smell up the place! Not even soap! We just run under warm water until the paint almost stops coming out. (see video) We comb the bristles straight after that as they are all twisted. You can use a regular hair comb with wide-spaced teeth. My favorite tool has curve on the back side for squeezing out the paint from a roller cover: ha! Two in one for less than $3! Wire brush: remove the dried paint on the outside of the paint brush. Buy a good wire brush: thewirebristlesfall out of the cheap ones and end up in your drain pipe! 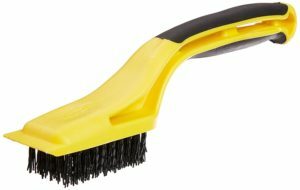 Go Plastic: Here is what I consider the best wire brush . 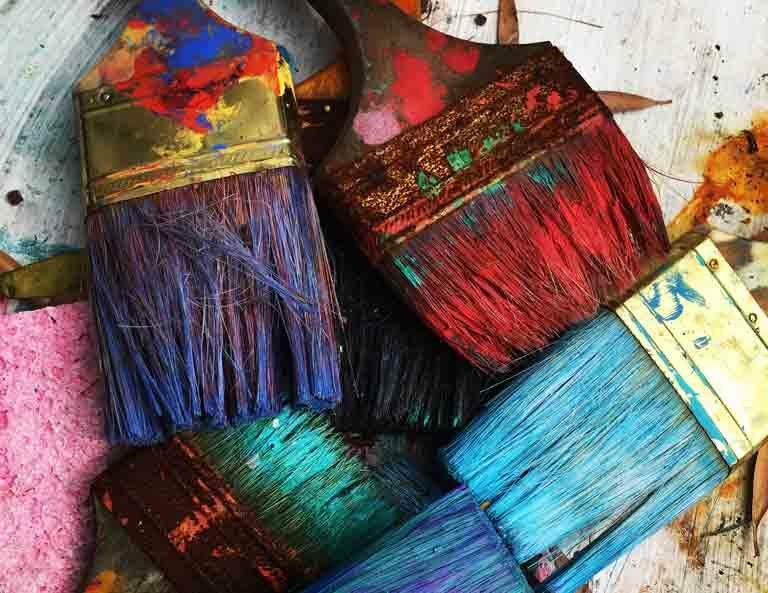 What kills quality paint brushes? Leaving solids in the bristles. So you just need to get that out which is not hard. That way you will keep for long your best painting brushes. Pro tip: Having said all that, a quality brush such as a Purdy, will change in character after a few hours of use: like a noodle gets soft when soaked. In cases where we are doing fine trim work with tight corners and we need sharp lines the first time, we would not use a brush that has been soaking. We’ll use a well-dried brush as it is stiffer and better. 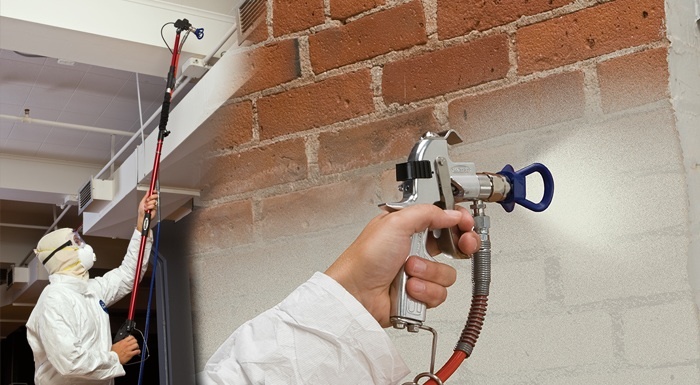 But for your basic wall work: we only clean when done or when changing to a different color. 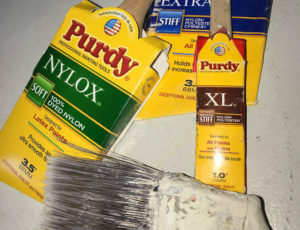 We have a post on how to avoid cleaning, but here is the short version: If you are changing from some sort of white to some other white-ish color, don’t clean, just squeeze and switch paints. Yes the first dip may have some of the last paint, but… meh. We keep it real. And we get done fast. And our work is good. Why do paint brush and paint makers tell you to use soap etc? To cover their collective derrieres.